When we look back over a short period of time, it is amazing how many incidents we are called to, and also the diverse range of those incidents. In the last 12 months we have been called out on more than 200 separate occasions. Sometimes we will go for many days without a call, which is fantastic. At other times, we will have to attend several incidents on the one day, sometimes to different fires or accidents at the same time. The range of incidents is varied in terms of both size and type. We will naturally become involved in all major fires in the region, such as the tragic Black Saturday fires in 2009, the fires to the north of Melbourne early in 2014 – to both fight and control the fires and importantly protect life and property. There are numerous other incidents that we are called to on a regular basis, such as grass and scrub fires, unauthorised burning, road accidents, car fires and explosions, smoke scares, house fires, chemical spills, gas leaks, alarm calls (real and false) and chimney fires. 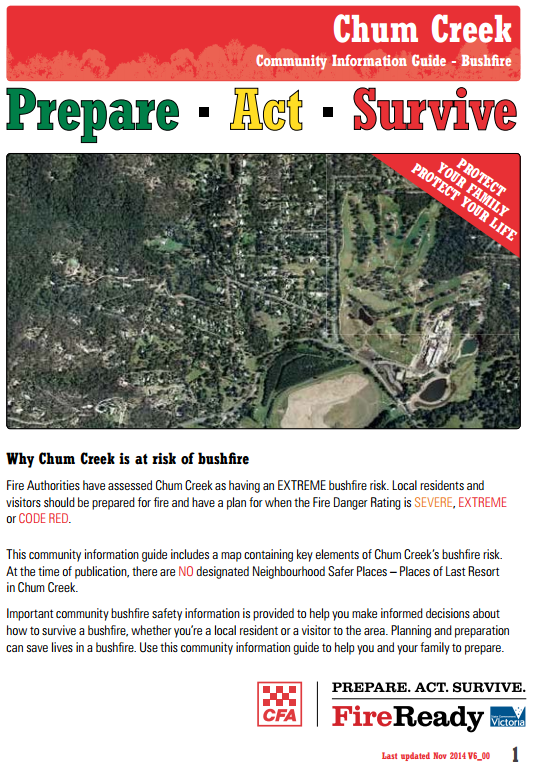 We are also involved in controlled burnings, especially prior to the major fire season. On top of that there are the many Public Service activities we are involved in, such as the Good Friday Appeal Collection. As well as ongoing advice and assistance to residents and businesses in the region. The important thing to remember is that we respond to every call, real or false, with most being active calls that will require some action. 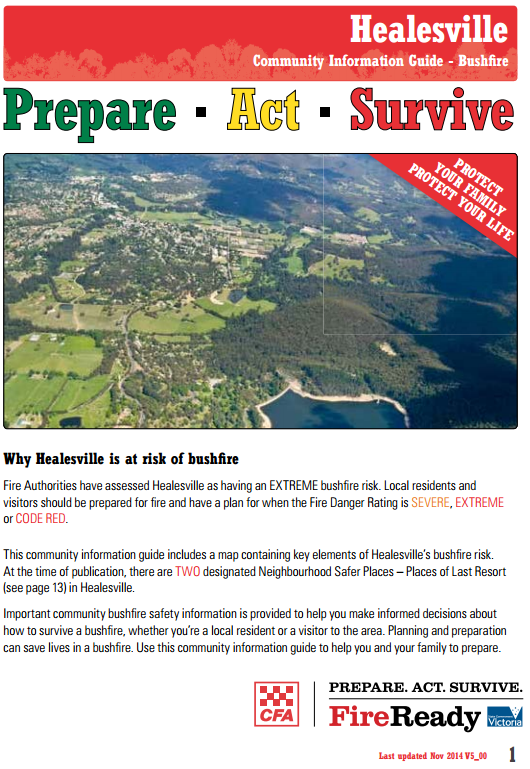 The Healesville Fire Brigade has been providing an excellent service, protecting our community for nearly 120 years. Currently there are about 40 operational volunteers, the strongest we have been for many years, and the membership includes people covering a wide range of ages and occupations. We are indeed an interesting mix: airport workers, arbourists, artists, AV technicians, builders, bus drivers, chefs, clerks, community workers, computer experts, contractors, electricians, farmers, first aide educators, graphic artists, heavy machine operators, househusbands, housewives, labourers, nurses, plasterers, restaurateurs, retirees, road construction workers, students, traffic controllers, truck drivers, veterinary assistants … and more! Several of our members have served the brigade for 20, 30 or more than 40 years, while some have been around for only 12 months. However, we are always looking for new members, for both firefighting and non-firefighting roles. And now is the ideal time. With the end of the fire danger period, we are able to dedicate more time to training than the hotter, more active months. You will receive comprehensive training, including basic fire ground practices, pump operation and fire safety awareness, with safety as our Number One priority. Other training may include: leadership training, first aid accreditation, communications, breathing apparatus, and much more. We also need people who may prefer to be involved in areas such as driving vehicles, administration, assistance with community education programs, fund raising and social activities. We are particularly in need of people who are able to be on call during the day, as many of our members work or have to spend time out of the area. In fact, around 70% of our calls occur during the daytime. If you live in the Healesville or Chum Creek area, and spend most of your daytime hours in the Healesville and Chum Creek areas, you may be exactly who we are looking for right now. For more information please visit the CFA website or contact us directly via our contact page.